1. Can you explain to young people just what an architect is? An architect is someone who designs buildings and other interior and exterior spaces. We all interact with different kinds of spaces almost every moment of our lives - we live in a house, we go to school in a special type of building, we shop for groceries in a different type of building, the cabins at camp, the locker rooms at the gym, etc.Architects are responsible for designing these types of environments for our everyday lives. The best part of my job is getting to know the people for whom we are designing a building, or space for. The better you know the future occupants of the space, the more specific you can design it for their needs. 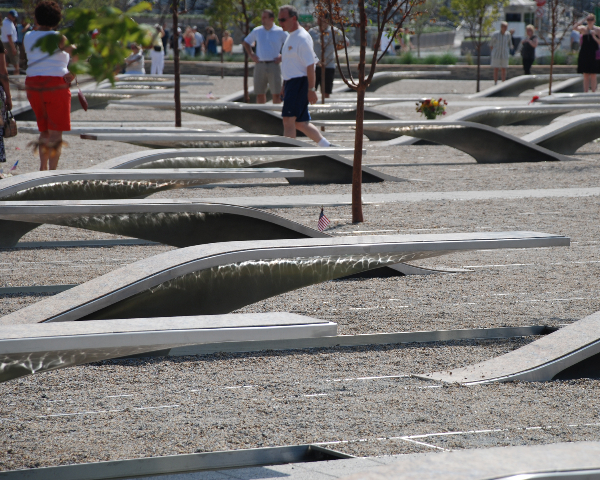 For instance, when we won the design competition for the Pentagon Memorial, we had the very fortunate chance to become dear friends with many of the 184 family members who lost loved ones on September 11, 2001. Understanding their pain and how they wish to remember their loved one enabled us to choose specific materials that would engage the senses and put a greater emphasis on life and ultimately create an environment that is solemn, contemplative and peaceful. My other favorite part is that I get to draw and build little models - both by hand and in the computer. It's challenging, fun and very creative! I would say the most difficult part of being an architect are the very long hours in the office. We have our own business and we are the boss, so those hours are much longer than if we were working for someone else. Also, designing and constructing the building take a long time - nothing happens over night! You have to be patient, but the final outcome is incredibly exciting and all your hard work will be used and appreciated my many, many people for many years to come. One of the most exciting moments during the construction of the Pentagon Memorial was about 2 months before it was complete. I was on site checking out the progress like I was every week for the last 2 years. The little pools beneath the Memorial Units (or benches) had just been filled for the first time and the fountain system was turned on to create the flow and ripples that would be seen throughout the park. It was a very sunny summer day and when I looked across the whole park, the sunlight was bouncing off the water and reflecting onto the stainless steel above creating the most spectacular shapes and movements (kind of like a swimming pool) - it was so beautiful and something that I never imagined. Now I tell everyone that they should visit the Pentagon Memorial on a bright sunny day when the sun is high in the sky to see the "dancing reflections" on the Memorial Units. 5. What are the necessary skills/degrees needed to become an architect? You must have a professional degree in order to become an architect.There are two ways to obtain a professional degree: 1) you can attend an undergraduate college that has a 5-year Bachelors of Architecture (BArch) program or 2) you can attend a 4-year college and major in anything you want, then attend a graduate college/university to obtain a Masters in Architecture (MArch) which is typically a 3-year program. That is what I did.I attended Bryn Mawr College as an undergraduate and studied Urban Planning and Architectural History. After working for an architect for 3 years, I returned to graduate school at Columbia University and received my Master in Architecture. The following skills are very important in being an architect: math, knowledgeable with computers, creativity, basics of physics, people skills, record keeping and drawing. career? How can they begin now to get prepared for your career? If you are interested in becoming an architect, I suggest you start to build a portfolio of your creative work - artwork, drawings, photography, building designs, etc.There are some summer programs that are intensive studies in architecture for high school students who might be thinking of pursuing a career in architecture. Attending one of these summer programs is encouraged because you can produce a lot of work that you can use in your portfolio when you apply to college or graduate school. 7. Where can you work as an architect? You can work as an architect just about anywhere in the world. Anywhere there is a thriving society, there is the likely need for an architect! 8. Describe a typical day at your job. We have a somewhat unique situation whereby our office is also in our home. So I don't really have typical days because they are always mixed up with other "life" things like my teaching job and our dog, Zoe and other things that may pop up. But from what I remember when working for someone else, my day typically started with a meeting with my project team on who was going to do what that day, followed by a couple hours of drafting and modeling at my computer, followed by making a little sketch model out of paper or chipboard, followed by a visit to the client and/or the site under construction, followed by a couple of status-check emails and internal meetings. We had a lot of fun in the office because everyone is so invested in their projects and excited to see them become a reality. in school or your childhood help spark this interest? When I was a sophomore in high school, my English teacher had us read The Fountainhead, by Ayn Rand.It is a story about an architect who thinks "out of the box" and is constantly fighting for progression and innovation in society and wants his buildings to reflect that innovation - he basically was fighting for what he believed was right. It was very inspiring! Plus I found that I just loved making things and realized that my talent could someday have a positive effect on my community. The Pentagon Memorial, in Arlington, Virginia, honors the 184 people killed in the Pentagon and those passengers aboard American Airlines Flight 77 in the September 11, 2001 terrorist attack. The memorial, "Light Benches" was designed by Julie Beckman and Keith Kaseman, and was opened on September 11, 2008. Beckman and Kaseman's architectural firm is called KBAS. Thanks to Julie Beckman for the photograph!